SAN FRANCISCO (MarketWatch) — John Paulson, head of hedge-fund giant Paulson & Co., turned bullish on the U.S. housing market in early 2010. Now he’s got a fund that’s betting on a rebound. In November, the firm finished raising capital for the Paulson Real Estate Recovery Fund, gathering roughly $315 million in commitments from investors, according to two people familiar with the situation. Houses selling for more than $2 million spiked in 2010 in the San Francisco Bay Area, with the most pricey home sold in San Francisco for $15.5 million. Pui-Wing Tam talks with Stacey Delo. The vehicle is a private-equity fund, rather than a hedge fund. This means Paulson makes capital calls to investors when opportunities arise. It also means investors are locked in for many years. Paulson seeded the fund with some of his own money and brought in Michael Barr, a former real-estate, private-equity specialist at Lehman Brothers Holdings Inc. /quotes/comstock/11i!lehmq (LEHMQ 0.04, 0.00, 0.00%) , to run it. One of the fund’s main strategies is to buy undeveloped tracts of land that already have environmental and building permits. Roads, sewers and electricity may also be in place, but not homes, according to one of the people familiar with the fund. If the real-estate market recovers enough for developers to start building more new houses, this may be the type of land they buy first. That’s because a lot of the costly, time-consuming preparation work already has been done, the person explained. Such a recovery may take years to materialize, if at all. TrimTabs Investment Research warned Thursday that the housing market is unlikely to recover for five or six more years. 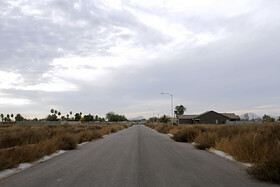 A paved road is surrounded by weeds in an unfinished subdivision in Coolidge, Ariz. In the meantime, the Paulson fund has the flexibility to hold onto land. That’s because investors in the fund are committed for multiple years and the land is purchased with no leverage, the person added. The 3,662-acre property bumps up against a massive car-testing track part owned by Nissan Motor Co. /quotes/comstock/64e!7201 (JP:7201 849.00, +6.00, +0.71%) /quotes/comstock/11i!nsan.y (NSANY 20.41, -0.12, -0.59%) and the Ak-Chin Native American community. This should be one of the first properties to be developed in the area, because “home builders and commercial developers will first go where it is most economical to develop,” according to a presentation given by Paulson’s lawyer for the project to Pinal County’s Board of Supervisors in November. Red River already has spent $12.1 million on water and sewer infrastructure, along with almost $1 million in fees for a subregional transportation study, the presentation said. The presentation also said John Paulson is “motivated to develop” in the next five to seven years, while noting that the property is the largest single asset in the fund. One issue facing the Paulson fund is that environmental and building permits for this type of property may expire and need to be extended. In this case, a contract between Pinal and Red River states that the county’s board of supervisors “shall not unreasonably deny” a request for a 10-year extension, according to the presentation, drawn up by lawyer Jordan Rose of the Rose Law Group. The presentation then lists 16 reasons why an extension should be granted. The final argument stresses how Paulson’s involvement may show other investors that Pinal County is an attractive place to put money to work. “The market watches and responds to John Paulson’s investment decisions,” the presentation said. If the Red River development agreements aren’t extended, it will send a message to investors that “Pinal County wants to make it more difficult, more expensive and less attractive to develop in the county,” according to the presentation. If the extension is approved, it would send the opposite message. “When the market comes back, we want it to come to Pinal County,” it added. In November, Pinal County staff recommended an extension of the development agreement be denied, according to Heather Murphy, director of communications and public affairs for Pinal County. Part of the dispute centers on impact fees which the county charges for new developments. The fees are also charged when development agreements are extended, Murphy said. The theory is that a rancher, for example, who’s been in an area for decades, shouldn’t have to pay for infrastructure improvements to accommodate a big new development built by someone else, she added. There are plans to upgrade more than 100 miles of roads in the area over the next decade at a cost of $237 million, according to the presentation by Paulson attorney Rose. Paulson may be required to pay nearly half of this, or $114 million. But that’s not legal because Arizona statue requires that there be a direct benefit from such fees to the payer, the attorney argued in the presentation. Most of the roads that are due to be upgraded aren’t near the Red River development, the presentation noted, while estimating that $107.2 million of the impact fees would not directly benefit the property. The Board of Supervisors has since met and there was a motion and a second in favor of Pinal County staff drafting the extension and bringing it back to the board for formal approval, Rose said. “This is expected to occur in late February or March,” she wrote in an email to MarketWatch.